Seamless siding is one of the best siding options for your home – especially if it’s made from steel. At ABC Seamless, we make seam-free steel siding that’s not just irresistibly attractive but also exceptionally durable. From the day it’s installed, you’ll love the way your ABC siding looks – and performs. Your ABC seamless siding is made from heavy-gauge, hot-dipped, G-90 galvanized steel, and manufactured onsite, the day of installation. And because it’s custom-cut, you’re assured a perfect seamless fit. That means it’s precision-cut, one full panel at a time, tailored to the exact dimensions of your home – not slapped together from short individual pieces like boxed siding. IMAGINE! No unsightly seams! 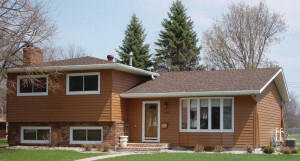 In contrast, typical siding has approximately eight or nine seams every 100 square feet. Your seamless siding will have a sleek, pristine finish, as well as impressive curb appeal that’ll make even the Joneses jealous! You might say it’s extremely weather resistant to extreme weather, too! As outdoor temperatures swing from frigid lows to sweltering highs, only negligible expansion or contraction occurs, so you don’t have to worry about common siding problems such as warping, breaking, or cracking. Our seamless siding also withstand flames and temperatures up to 2,500 degrees Fahrenheit. You couldn’t say the same about plastic or fiber cement siding! It’s low in maintenance, too. You won’t have to scrape, paint, or pressure wash your ABC siding to keep it in pristine shape. An occasional rinse with a garden hose is all that’s necessary to revive its striking, like-new appearance. It comes in several attractive options, including a log style and a traditional board and batten style. To learn more about this amazing steel seamless siding, contact ABC Seamless today.